H/T to FB friend Ken Danieli. In 2014, RealClearPolitics labeled 30 House seats as “Toss Ups.” — Too close to call at the end. Republicans won 70% of those seats, Dems 30%. In 2016, it was 20 Toss Ups. GOP won 80%, Dems 20%. If the actual Election Day results are similar to 2014 or 2016, GOP holds the House. 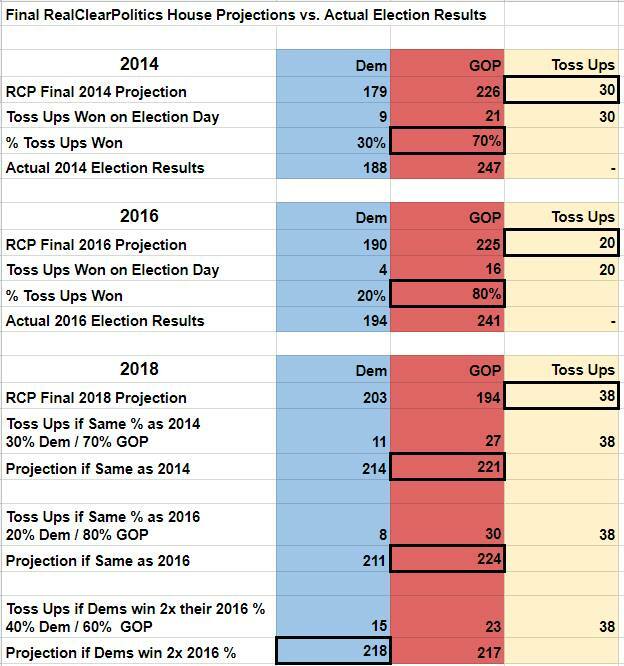 If Dems win twice the % of Toss Ups as they did in 2016, it gets them to 218. 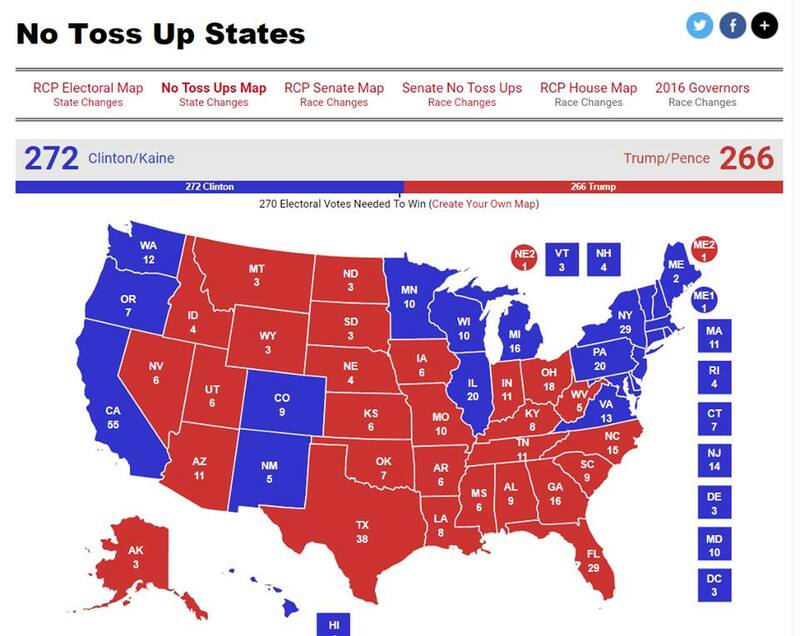 In a related “it’s right there in RCP if you’d just actually look at it” analysis, in 2016, the Final RCP No Toss Ups Electoral Map had Trump only 3 Electoral Votes from victory. It’s a map that everyone could see but no one reported on. I don’t recall a single report that “according to RCP, Trump just needs 3 more Electoral Votes to win” on the days before or day of the Election. The media just chose to leave the toss ups out and show “Clinton has 203 EVs and Trump has only 164,” (with 171 Toss Ups)…. so she’s certainly gonna win. Trump won by 77 Electoral Votes. The mostly liberal media uses RCP as its Polling Bible, and pays for the polls that go into the RCP averages, but fails to report everything that their own Bible tells them. But I didn’t see conservative media report this data-based analysis either. Trump also had the momentum, if not the lead, in the national polls on the same site. Momentum is a very real thing. This entry was posted in 2016 Presidential Race, 2018 Election, Politics, Uncategorized. Bookmark the permalink. If those bums try their intimidation tactics today, they absolutely won’t get a pass like they did under BHO and Holder. Hopefully there are countermeasures in place to nip something immediately before they scare any folk off. Yesterday…yes. BUT they still have the tacit, if not explicit, support of the BGI and many members of Congress. You see any members of the black/Democratic political organization of any state denouncing their actions? And y’all get on out dere to vote befo’ the Old Testiment God of Chuck Lorree (nee Levine) be visitin’ judgement upon yo’ conservative votin’ tokhes. The only blacks the CBC denounces are Tim Scott and Allen West. Are they allowed inside the voting areas? Not sure how close they are to the polls. You can have armed, threatening thug Black Panthers outside but those dangerous political signs are prohibited. I don’t like the intimidation tactics, but I guess they are legal? If they get in someone’s way, block them, I would hope that’s illegal. Of course it’s illegal but many city PD/county SOs are afraid to confront them. I’ll be sorry I asked, but why? They are cops for sweet pity’s sake. Heavily political regardless of reasons but the thought that a flood of armed and itchy Panthers may suddenly show up in that LEA’s jurisdiction. Over the last few years the Panthers have been deployed – most notably when there was that dragging death of a black man in Texas. There was that unreported and ALLEGED attempt by Texas-based Panthers to enter New Orleans right after Katrina to ‘defend the security’ of black stay behinds who were being oppressed by the police as they looted. The BGI likes them as the serve as a junior brownshirt organization, intimidating all who threaten to hinder their agenda. That dragging death, if we are talking about the same one, was horrible. But we already have LE for those things. I get what you are saying about it being political, I just wish leaders of all counties, states would do the right thing and stand up to them. Panthers and BGI didn’t give a poop about that guy other than the shock his death created and how they could use it to their personal political purposes. I just got back from voting, it’s just a little crazy for a midterm election even at my little rural Church voting place. The parking lot was totally full, had to wait for someone to leave before I could even pull in. Thankfully by the time I got in many were heading out so I didn’t have to wait that long to vote. I don’t know exactly what it means, especially as nuts as our state has went this year, but I overheard the lady checking you in tell a friend of hers that she’s barely opened the democrat roll book. I’m still not trusting this man. Totally understandable. I still have doubts. Graham Unleashed! Never too late to jump on the Trump Train…but he does have a bit of make-up to do what with the Middle East interference. Still watching Ocasio-Cortez. She needs to lose. With 94% of the precincts in she has 78.7% of the votes…closest competitor is at 13.3%, not looking good. Makes me sick, but she won. They have elected a total and complete moron. I’m not a happy camper with the dems taking the house. It’s a redistricted district. It’s almost half hispanic, 11% black and 17% Asian. Funny how when the redistrict hispanics are mostly considered white as it helps swing the demographics in the Rat’s favor. I see it as freeloaders electing the engine they hope will make their freeloading more profitable. I can’t find the medial income figures for the district but I do see it has over 9% unemployment so that should point one’s nose in a direction. Helping someone who doesn’t want to work when they are able to gets on my nerves. I have seen too much. Too many people who can’t support themselves and just keep having babies and the government just keeps supporting them. People who hit legitimate bad times struggle to qualify. We are so screwed up in this country. I really can’t believe some of these elections tonight. I guess I hadn’t realized there were so many people who think that way. We have new generations of voters voting who believe that Santa Claus and the Easter Bunny are Democrats. I don’t have a bright outlook for our country at the moment. Am waiting to see what happens with these caravans. As far as I am concerned, I don’t want even want one to cross our border. I don’t understand at all why we are building tent cities. I’m buying more ammo, food and medical supplies. We’re seeing red states being turned blueish by the Rats managing to assign immigrants to purple areas to tip the scales. No, I do not feel the outlook’s brillante y soleado at all. These idiots saying these people should be allowed in have no idea that the ones coming in will steal their freebies. Blind leading the blind. They’ve been brainwashed by decades of BS fed ton them in the educational system and in the media. They ignore the barrios and ghettos and their related crime, they believe that if we just let them out to be what they really are we’ll have Latin dancing in the streets, it will be a nationwide TV sitcom. I’ll tell ya one thing. Trump said clearly and more than once that not one will cross the border.. He better make that happen or I will know we are doomed. Of that there is no doubt. Thousands upon thousands of non-English speaking semi-educated folks who’ll not only be dependent upon tax dollars for decades to come but don’t seem to be as interested in becoming true Americans as they are moving their culture here and forming a Little Latin America at our expense. Angelle Staria Liter… on It’s Doggityday!